There’s perhaps no other automotive company that has tried harder to put a halt to the Ford Explorer’s 25-year run as the best-selling SUV in America than Chevrolet. But, try as they might, they keep failing, in part because the new Ford Explorer continues to be upgraded, updated and enhanced each and every model year. 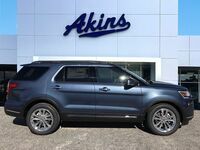 That’s especially true for the 2018 Ford Explorer and its powerful and efficient engine options, its comfortably spacious interior, its sleek and sporty exterior and its comprehensive suite of advanced new safety, technology, comfort and convenience features. That means Chevy is going to have to try extra hard if they want to finally top the new Ford Explorer. Let’s see if they can pull it off in this 2018 Ford Explorer versus 2018 Chevy Traverse head-to-head model comparison. Hint: they can’t. 350 lb-ft. Max Torque 295 lb-ft.
As you can see in the table above, the 2018 Ford Explorer completely outperforms, outmatches and outclasses the 2018 Chevrolet Traverse in terms of horsepower and torque. 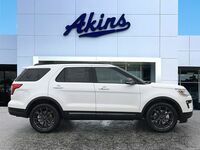 More specifically, the new Ford Explorer lineup can pump out up to 365 horsepower and 350 pound-feet of torque, while the new Chevrolet Traverse can pump out up to only 310 horsepower and 295 pound-feet of torque. It should also be noted that while the maximum horsepower and torque ratings for the 2018 Explorer are from the same engine, the maximum horsepower and torque ratings for the 2018 Traverse are from two different engines. 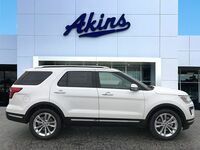 Now, you might be thinking that the additional power you’re getting with a new Ford Explorer means you’re going to have to sacrifice fuel efficiency, but nothing could be further from the truth. In fact, both models can get up to 27 miles per gallon on the highway. And while the new Chevy Traverse can get up to one more mile per gallon in the city, that’s not enough to actually make a difference at the pump. 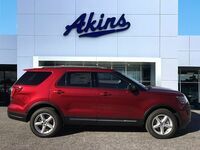 In the end, thanks to its horsepower and torque advantages and its comparable fuel efficiency, the 2018 Ford Explorer is the clear winner and easy choice for anyone in the market for a new SUV. If that happens to be you, please get in touch with our friendly and knowledgeable Akins Ford staff near Atlanta, GA. 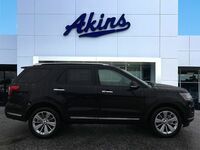 Interested in a Ford Explorer?